Given Bennett’s perspective, it wouldn’t be surprising to see him push for the development of fresh, alternative atonement metaphors, ones free from the weight of past use in the Christian tradition. However, he thinks the route forward actually consists in retrieval rather than innovation (p.2). 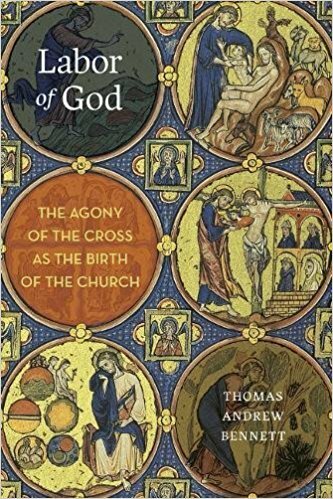 Inspired by passages from the Old Testament and the Johannine literature, as well as the works of Medieval figures like St. Anselm and Julian of Norwich, Bennett advocates for retrieving an oft-neglected metaphor: “The image of the cross of Christ as God’s labor to bring about spiritual birth” (p.5). By embracing this image, he is convinced we can revitalize atonement theology and recover a fresh appreciation for the “radically gracious self-giving love” embodied by Jesus in his life, death, and resurrection (p.5). Some may find Bennett’s construal of the cross as the labor of God to be a bit jarring because of its maternal imagery. I doubt he would have much of a problem with that, given his complaint about the tameness of contemporary atonement language. In fact, it seems like part of the point. According to Bennett, this metaphor opens up a number of fruitful theological avenues. First, its provocative juxtaposition of maternal imagery with Jesus’ death on the cross reminds us that, like all models of the atonement, it is a metaphor. This matters for Bennett because he finds that something important is lost when we forget the suggestive nature of all language about the deepest meanings of Christ’s death (pp. 29-31). In this respect, Bennett echoes (knowingly or unknowingly) Scot McKnight’s 2007 book, A Community Called Atonement, in which McKnight also embraces the richly metaphorical nature of Christian language about the significance of the cross (pp. 36-39). Bennett also points out that seeing the cross as labor gives us an image that brings together Christ’s suffering with the bringing about of new life and transformation, thereby connecting together “objective” and “subjective” images of the atonement that sometimes sit rather uneasily together (pp.62,80). Though Bennett doesn’t seem to mention John Chrysostom, I couldn’t help but be reminded of a line from Chrysostom’s famous Pascal homily, in which he boldly declares that “He [Jesus] has destroyed death by undergoing death” (quoted in McKnight 2007, p.105). In this respect, there seem to be some intriguing commonalities between how Bennett develops the cross as labor metaphor and some of the more classic Christus victor narrations of the atonement. Delving into the cross as the labor of God does bring tension into the classical doctrine of God’s impassibility. After all, traditional conceptions of God as transcendent and unchanging don’t seem to have much in common with the passionate travails involved in the bringing of new life into the world. Bennett himself avoids thoughts of patripassianism while still being open to “nevertheless acknowledging the role of suffering within the divine Being” (p.51). For those who still wish to preserve notions of the God’s impassibility, it’s worth probing what exactly is being claimed when God is called impassible. J. Warren Smith observes that in the ancient world, suffering was commonly thought of as passive “degenerative change” (2016, p.198). Therefore, he suggests that those in the early Church who worked to preserve the doctrine of God’s impassibility were trying to avoid the conclusion that Christ was broken down, defeated, or corrupted by the suffering of the cross. When those concerns are kept in mind, we see the Orthodox theologian Kallistos Ware cautiously affirming the idea of a suffering God, so long as it’s kept in mind that “precisely because God’s suffering is the immediate consequence of his love, this suffering is active and creative… The suffering God is at the same time the undefeated God” (2016, p.233). Turning back to Bennett’s work in Labor of God, I think we see the same kind of concern regarding the nature of Jesus’ suffering to be present. That is why Bennett finds it important to assert that Jesus entered into the suffering of the crucifixion willingly, and that on the cross “God does not perpetrate or merely endure violence but instead transforms it into a generative act” (p.43). In this way, he demonstrates more continuity with the past tradition on the doctrine of impassibility than one might expect. Bennett might come across as something of a solitary voice in the wilderness with his proposal highlighting the cross as labor, but he’s actually not alone. In Michael Gorman’s 2014 exploration of atonement theology, The Death of the Messiah and the Birth of the New Covenant, he also incorporates birth imagery for the events of Christ’s death and resurrection, noting that such language has roots in Romans and Galatians, in addition to John’s Gospel (pp.3-4). The use of labor imagery for the cross is used in at least some contemporary liturgical traditions as well. One of the thanksgiving prayers said by United Methodists in the context of the eucharist, for example, includes language praising God for Jesus’ suffering, death, and resurrection, asserting that through these things “you gave birth to your Church, delivered us from slavery to sin and death, and made with us a new covenant by water and the Spirit” (Service of Word and Table I). Labor of God is an inspiring and deliberately provocative exploration of the cross that focuses on a maternal atonement metaphor that until now has generally resided near the edges of the Christian tradition. Bennett may very well be right that much of the Church’s habits of speaking about the cross have become stale, but this little book joins a number of volumes published over the last few years by thoughtful figures like Gregory Boyd, Fleming Rutledge, N.T. Wright, and Brian Zahnd that seek to infuse fresh life into the world of contemporary atonement theology. For some readers, his way of approaching the task might be just what they need to overcome atonement-debate fatigue. At the very least, it’s an absorbing read that expands our ways of understanding Jesus’ death on the cross, which to me is no small accomplishment. Gorman, Michael J. The Death of the Messiah and the Birth of the New Covenant: A (Not So) New Model of the Atonement. Eugene, OR: Cascade Books, 2014. McKnight, Scot. A Community Called Atonement. Nashville, TN: Abingdon Press, 2007. Smith, J. Warren. “Suffering Impassibly: Christ’s Passion in Cyril of Alexandria’s Soteriology.” In Suffering and Evil in Early Christian Thought, by Nonna Verna Harrison and David G. Hunter. Grand Rapids, MI: Baker Academic, 2016. Ware, Kallistos. “The Impassible Suffers.” In Suffering and Evil in Early Christian Thought, by Nonna Verna Harrison and David G. Hunter. Grand Rapids, MI: Baker Academic, 2016. This entry was posted in Book Reviews and tagged atonement, Atonement metaphors, Book Reviews, Church History, Interpretation, J. Warren Smith, Kallistos Ware, Michael Gorman, Scot McKnight, theology, Thomas Andrew Bennett by joecrow91. Bookmark the permalink.